These articles are some of my favorite stories from major media outlets that feature myself, my app or branding work, my design partner Christopher Gulczynski or Bumble. Herd met Andreev at a dinner in 2013 while she was at Tinder, and she'd made an impression. "To be honest, I immediately fell in love with Whitney's passion and energy." She and Andreev brought in two of her fellow former Tinder executives, Co-Founder, Chris Gulczynski and VP of Design, Sarah Mick, to design the new app's back end (correction: branding) and user interface. The two left Bumble in April to launch their own agency but still share the 1% of equity not held by Andreev and Herd. The goal was to make something that was really functional that felt like it made sense, but then also impose some limitations, some sort of organization, to where you could empower people. What we thought and talked about in the office was how can we integrate this in a way that feels really comfortable and natural to the women using the app, and we tell them, this is just what you do on Bumble, so that it’s normal for them. I tried to recall a piece of recent work that resonated with me, nothing came to mind. The reason being, I live in Manhattan and am bombarded with advertising and branding all day long, particularly on my walk to work from my home in Noho to Soho where our office is. Visually speaking, they went to a different color palette than the Bumble yellow, while still using the same iconography, and the tone of the copy and the headlines in the context is amazing. Bumble is betting that its matchmaking technology can do more than foster romantic or personal connections. 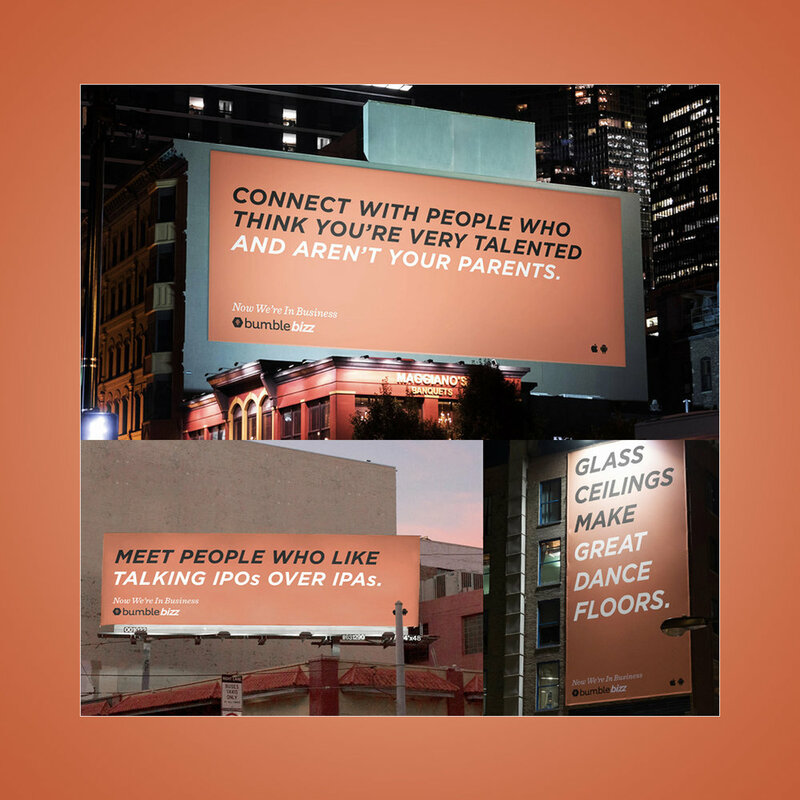 After launching its Bumble BFF vertical a year ago, which pairs users with new friends, Wolfe is repositioning the company to make room for BumbleBizz, a professional networking vertical debuting in early October where users can look for work, find a business partner, or hire new talent. Out of all the Bumble Hive’s thus far, the Los Angeles pop-up will most embody Bumble’s digital experience in physical form. We used color and patterns in the Hive according to the three Bumble brand verticals: Bumble, BFF, and Bizz. The hexagon shape also appears in the chandeliers, tiles, rugs, and side tables to carry the Bumble brand throughout.